I’ve been practicing yoga seriously since my daughter was a few weeks old. She’s watched me go from a wobbly, anxious new parent to a (sometimes) centered, seasoned yogi. And now, as a preschooler, she regularly enjoys yoga, too. 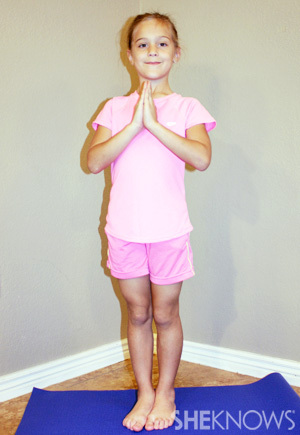 Learning about yoga early and developing a practice is a wonderful habit for young children. It gets kids moving and engaged in a fun physical activity, and it also helps children feel more focused, calm and less stressed. Kimberly Lipson, who recently completed an intensive yoga-teacher training program at Urban Yoga in Phoenix, shares her expert opinion on nine yoga poses that are great for beginning yogis. To accomplish this position, have your child lie on her back and bend both knees so that her feet are flat on the ground. Have her bring her heels as close to her bottom as she comfortably can and then lift her hips high to the sky. 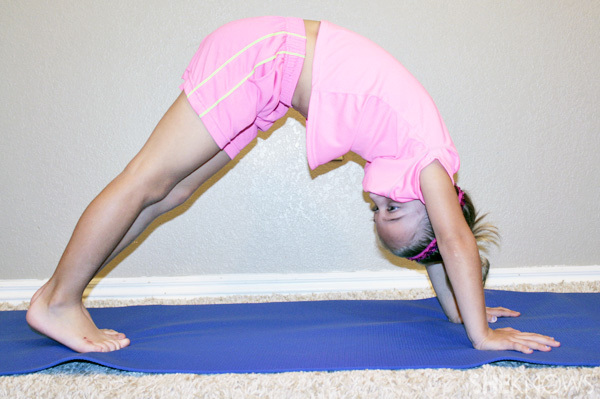 Most kids have a very flexible spine, so they can press their hips up very high. This pose is also great for leg strength, ankle stability and energy. Instruct your child to begin on hands and knees and then tuck her toes and lift her bottom high so her body and the mat create a triangle, pressing her chest forward with her head hanging down. Instead of allowing kids to stand on their tiptoes, which may happen naturally, have them focus on keeping their feet firmly on the ground, bending their knees if needed. Kimberly notes that this pose benefits the flexibility of the sides of the body. She advises that you should help your child extend her arms into the air and stretch her fingertips off to both sides, which will cause her to balance the weight of the torso while at the same time strengthening obliques and adding the necessary flexibility. “The most important reminder to give yogis is to remember to breathe while doing this pose to allow the full stretch to occur,” she says. Most kids will set their lifted foot on their mid-calf. If they are very steady, they can place their foot a bit higher, as long as they don’t press it directly into the knee joint. Kimberly says, “This is excellent for posture, peace, lengthening and strengthening. It is so simple yet so powerful. This is one of Kimberly’s favorite poses! She says, “Hamstrings are typically tight, but the longer you stay in rag doll, the looser they become. This is wonderful for preventing injury because it builds flexibility. In addition, it is fabulous for reversing the blood flow, once again. Have your child lie on her back, pull her knees toward her belly and then grab on to the outsides of her feet. Then tell her to open her knees as wide as the torso and press her feet into her hands. 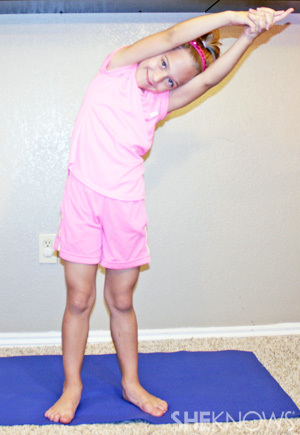 Kimberly notes that this pose is great for the spine, so it is important to instruct your child to keep her tailbone on the ground during this pose. Kimberly notes that this pose is great for opening the hips and a good stretch for the ankles. Pushing down on the knees or thighs with her elbows as she keeps her feet pressed together allows the hips to open up more. This list wouldn’t be complete without the pose of the child, which Kimberly refers to as “the place of safety.” From all fours, tell your child to sit back on her heels, resting her head on the mat. Then let her “walk” her fingers away from her body to stretch the hips, thighs and ankles.